It really was just a matter of time. The zombie craze has grown so large it’s become its own genre: Games, movies, books, you name it. There isn’t an entertainment medium that is immune to the zombie craze, so it was inevitable that people would begin to find new ways to interpret it. The popular image of a zombie is one of horror. A zombie is a rotting corpse with a hunger for human flesh, and perhaps the odd side dish of brain. These corpses are traditionally subject to decomposition, which gives them a monstrous look. Zombies are viewed as deadly and pitiless, without emotion or memory. They are animated corpses, bearing no resemblance to the person that used to own the walking meat suit. They are not worth pity or hatred, they are a mindless scourge like locusts. But when a trend has grown so large, it begins to encourage people to think about it in a different way. What if the zombie were victims, trapped within the confines of their own ghoulish nature? What if the person the zombie used to be was still there, just below the surface? Would they be capable of remorse? What about love? That is a question at the heart of Warm Bodies, a love story that challenges the nature of zombies and humanizes the post-human monsters with humor and heart. At times the message can be a bit heavy handed, and the more horrific aspects of zombies are severely muted in the movie. It’s still there, but it is more forgivable to see a zombie eat a person in this world. The film stays away from the gore and shows the zombies as pitiable creatures. Zombie purists are going to instantly reject that, but if you can look past it, you’ll find a charming and generally funny movie for the date-night set. It doesn’t hurt that the main zombie in the film is adorable rather than horrible. 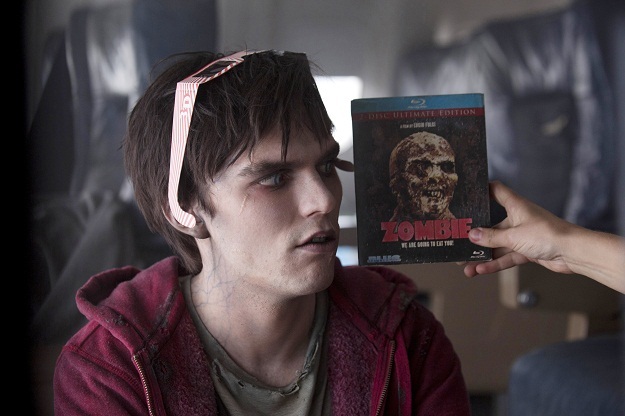 The zombie known as “R” (played by X-Men: First Class’ Nicholas Hoult) is one of the lucky ones. Despite his condition – being dead and all – he has something of a life. He lives in an abandoned 747 aircraft, hangs out with his friend (Rob Corddry), and occasionally ambles into the nearby city to pick off members of the last surviving enclave of humanity. It’s not a bad life, even if it is a bit hollow. R doesn’t particularly like eating people, but he doesn’t really have a problem with it either. When the hunger takes control nothing else really matters. Plus, there is the added boon of eating human brains, which gives zombies the memories of the eaten, an experience somewhat akin to a drug rush. After eating the brain of a random human, R’s memories – combined with a “love at first sight” attraction – cause him to go against his nature and save the beautiful human Julie (Take me Home Tonight’s Teresa Palmer). He takes her to his home in the abandoned 747, and slowly begins to regain his humanity. They both know it can’t last though, and despite their growing bond, R agrees to help her return to home, unaware that together they have set something in motion that will threaten them and possibly change the world. If you look past the supernatural aspects, Warm Bodies is something of a traditional love story, just told using a different set of circumstances. The film really comes down to the performances by Palmer and Hoult, who dominate the screen time. The other characters are mostly background, with only a few exceptions like Corddry’s zombie character, Julie’s best friend Nora (Analeigh Tipton), and Julie’s father, the last city’s de facto leader (John Malkovich). Both are up to the task. Even though the story can veer towards beating you over the head with romantic themes, both Hoult and Palmer stay grounded and even subdued. It’s actually fairly remarkable that the characters work at all, since R is a corpse and Julie is basically a kidnap victim hanging out with a corpse. A sizable portion of the film then resides with Hoult’s voiceovers and Palmer’s reactions to his undead expressions. And yet it works, and the two have a weird, but fulfilling chemistry. Thankfully, despite being a flesh-eating, decomposing corpse, R is actually in pretty good shape. In fact, as far as zombies go, he is somewhat adorable. That makes it hard to connect with the nature of the zombies, but it’s an understandable sacrifice for a film like this. Warm Bodies is a romantic comedy built on a foundation of humor. There are laugh out loud moments – including a scene in the third act that casts the characters in a historical, and hilarious light – and even the more subdued jokes are entertaining. Still, it never really delves deeply into the zombie nature that it could mine for some dark humor. It’s somewhat surprising to see a zombie movie with a PG-13 rating. The films holds back a bit in order to make R – who is still a brain-eating corpse at the end of the day – sympathetic. His condition is horrific, but that horror is never really explored and at times the film goes out of its way to ignore it. The depiction of zombies is also somewhat inconsistent. R’s journey is well documented and believable within the confines of the film’s universe, but others take a leap of faith to buy into. There are shortcuts taken. None of them deter too much from the story at the core – R and Julie – but it also feels like there were a few missed opportunities to make some truly original jokes in an aspect of an over-saturated sub-genre that has hardly been explored. Warm Bodies is a love story, and a good one. Its macabre setting and lead character give it a unique twist on the rom-com, an otherwise tired genre that is always looking for new ways to give fans what they want. Warm Bodies does that. It is actually one of the more interesting romantic comedies to come along in years, and should appeal to all audiences. The film stops short of being groundbreaking, and it avoids some of the more problematic aspects of the zombie nature it exists in. Plus, overarching themes come up and smack you in the face until you recognize them; That isn’t really a bad thing, just a bit unnecessary since it manages to convey that without being so heavy handed. That doesn’t take away from what is one of the more original and interesting romantic comedies to come along in recent years.